As anyone who has read J.R.R. Tolkien's Lord of the Rings trilogy or watched the film adaptations directed by Peter Jackson should know, the events of that story were set in motion some years earlier when an unassuming hobbit named Bilbo Baggins found himself in possession of a certain ring of very great importance. Bilbo's tale was recounted in Tolkien's first novel about the time lost world of Middle Earth, The Hobbit, which has now been brought to the screen by Jackson as well. THE HOBBIT: AN UNEXPECTED JOURNEY is the first installment of what is evidently going to be another cinematic trilogy of films. After a long and mostly unnecessary history lesson about dwarves, and an equally unnecessary sequence featuring the elderly Bilbo (Ian Holm) and his nephew Frodo (Elijah Wood), the actual movie finally gets underway. 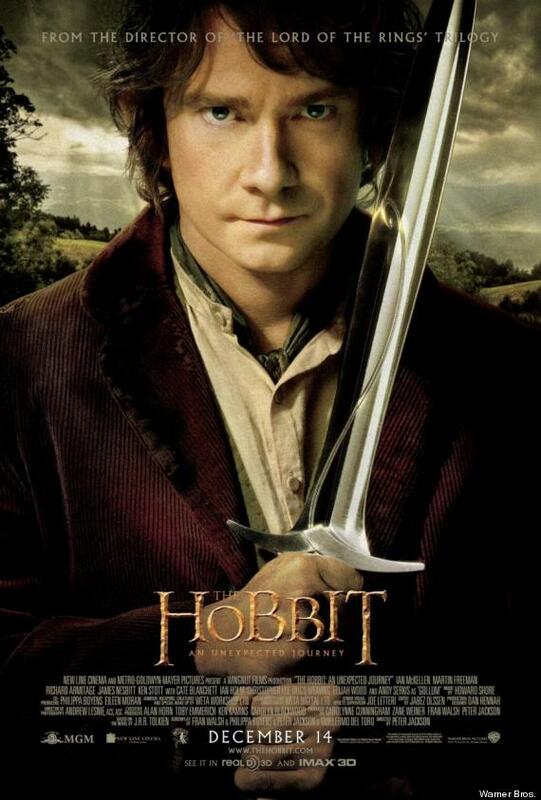 We now see Bilbo as a younger hobbit, played by SHERLOCK co-star Martin Freeman. He's perfectly happy to sit around reading, eating, drinking, and smoking until the wizard Gandalf (Ian McKellen) manages to rope the young hobbit into joining a band of dwarves led by Thorin Oakenshield (Richard Armitage) on a quest to reclaim the mountain home from which they were evicted by the dragon Smaug. Along the way the party encounters many perils, and Bilbo proves himself to be a surprisingly brave and capable adventurer. The most consistent criticism of AN UNEXPECTED JOURNEY is that the film is too long, and I can't really argue with that. The novel the trilogy is based on was originally intended as a children's book (I first encountered it in my elementary school library in fifth or sixth grade), and while it's still a fairly long and complex novel written in a style that would undoubtedly send most young readers running for the dictionary every few pages, it is nonetheless lighter and less weighty than the books that would follow it by a large degree. A perfectly satisfying film of the entire work could easily have been made that would fit into the running time of this installment alone. That's not to say that fans of these films won't enjoy some of the additional material Jackson has incorporated into his adaptation, some taken from Tolkien's exhaustive appendices to his trilogy, some thought up by Jackson and his co-writers Phillipa Boyens, Fran Walsh, and Guillermo del Toro. Aside from the aforementioned introductory material, most of the additions are at least enjoyable. They do, however, interfere with the flow of the film. Ultimately this feels more like 3 or 4 episodes of a television show strung together than an actual movie. If Jackson really felt the need to include all of this material, that probably would have been the better way to do it. It may all be a bit too much, but at least most of it is enjoyable. Undoubtedly the mountains of cash these movies are sure to earn played some role in their being made, but it's equally obvious that Jackson and everyone else involved has a genuine love for this material and aren't just doing this for a quickie cash-in. And if nothing else, the “fan edit” community ought to have a field day putting together different versions of THE HOBBIT once all three movies and their outtakes are out on home video. Maybe then we'll get a nice “just the book” version, but for now, we have what we have, and what we have ain't bad. 3 out of 4 stars. What format did you see this in? 3D and with the high frame rate. In all honesty, I think I would have preferred seeing it in 2D and 24 fps. The higher frame rate gives everything a weird digital sheen, and just doesn't look like film. That said, on the plus side I thought it made the CGI effects look more realistic.